It’s all too easy to judge a book by its cover. So when we see someone who is beautiful and radiant it is hard to picture them with inner demons, hardships and internal struggles. Today’s tattoo tale shares one lady’s personal challenges and reminds us not all disabilities are visible. Oceane, was not off to a great start in life. As an infant her mother would beat her and her father had his own challenges and could not care for her. Emotionally and physically neglected she was finally adopted at the age of 4, when her grand-parents intervened and legally adopted her. The “Mami & Papi” tattoo on her wrist is a tribute to the couple that raised her while also helping to cover up the slashing and self-abuse she inflicted on herself later in life. You see her troubles were not over. As Oceane started school and socializing with friends, she realized she was different. She had a learning disability and school was extremely hard. Kids made fun of her and she endured constant humiliation and intimidation. No matter how hard she tried focusing, learning was a constant struggle. She could not concentrate. Reading and memorizing were next to impossible. She kept trying to keep pace but she only fell further behind. Once diagnosed with severe Attention Deficit Disorder she at least started to understand what was happening to her. Medication and coping techniques were an aid but life was still a constant struggle. What kept her going is hard to say. Somehow she found strength to keep trying. She says: I just had to believe in myself. She somehow felt that if one truly believes in themselves then no matter the obstacles you can and will succeed. 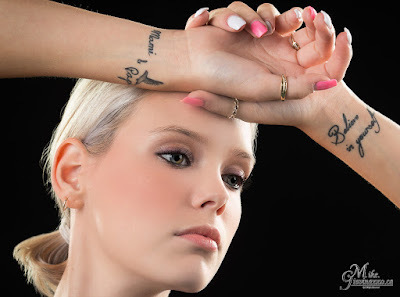 The words “Believe in yourself” tattooed on her other wrist are a constant reminder to never give up. So when the traditional school system failed, she found another way. She enrolled in an Adult high school. Here she found a more accepting peer group. People with jobs and families, other priorities and challenges; they were all working like her, the best they could to complete their education. This school format had more flexibility and allowed students to learn at a pace each individual could sustain. Her adoptive parents had initially viewed this as an admission of failure. Adult high schools were for the drop-outs, and has-beens. But to Oceane it was her way of getting up again; and get up she did - finally completing her high school diploma and coming to terms with who she was and where she wanted to go. She added an amazing tattoo on her ribs that translates to: The one who falls and rises again, is so much stronger than the one who has never fallen. This seems to summarize her philosophy and journey. Today Oceane still struggles but she draws strength from her accomplishments and doesn’t let challenges or obstacles stand in her way. She applied to college with her newly acquired diploma and was accepted. So she is now willingly embarking on a new chapter and is prepared to conquer the new hurdles ahead.